This proceedings volume includes papers presented at DGCI 2003 in Naples, Italy, November 19-21, 2003. DGCI 2003 was the 11th conference in a series of internationalconferencesonDiscreteGeometryforComputerImagery.Thec- ference was organized by the Italian Institute for Philosophical Studies, Naples and the Institute of Cybernetics "E. Caianiello," National Research Council of Italy, Pozzuoli (Naples). DGCI 2003 was sponsored by the International Asso- ation for Pattern Recognition (IAPR). ThisisthesecondtimetheconferencetookplaceoutsideFrance.Thenumber ofresearchersactiveinthe?eldofdiscretegeometryandcomputerimageryis- creasing. Both these factors contribute to the increased international recognition of the conference. The DGCI conferences attract more and more academic and research institutions in di?erent countries. 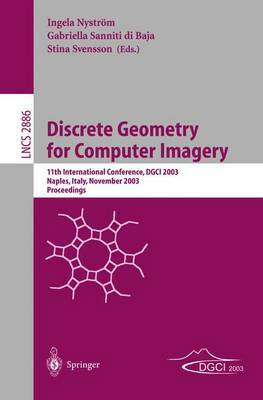 In fact, 68 papers were submitted to DGCI2003.Thecontributionsfocusondiscretegeometryandtopology,surfaces and volumes, morphology, shape representation, and shape analysis. After ca- ful reviewing by an international board of reviewers, 23 papers were selected for oral presentation and 26 for poster presentation. All contributions were sch- uled in plenary sessions. In addition, the program was enriched by three l- tures, presented by internationally well-known invited speakers: Isabelle Bloch ' (EcoleNationaleSup' erieuredesT' el' ecommunications,France),LonginJanLa- cki(TempleUniversity,USA),andRalphKopperman(CityCollegeofNewYork, USA). In 2002, a technical committee of the IAPR, TC18, was established with the intention to promote interactions and collaboration between researchers wo- ing on discrete geometry. The ?rst TC18 meeting was planned to be held in conjunction with DGCI 2003, to allow the members to discuss the activity of the technical committee. The outcome from this meeting will help the ongoing research and communication for researchers active within the ?eld during the 18 months between the conferences.